The pilot was landing a nose wheel-equipped airplane on a dry, paved runway. The pilot stated that after touchdown the airplane bounced and the nose of the airplane veered to the left of the runway centerline. In an attempt to correct the veer, he applied right rudder while adding engine power. When the airplane settled to the ground, and the left main wheel touched down, it pivoted the airplane sharply to the left. The pilot then applied full engine power in an attempt to abort the landing, but the right wing struck the runway, and the airplane subsequently went off the left side of the runway. The airplane continued into an area of grass-covered terrain, and the nose wheel collapsed, before the airplane came to rest on an adjacent taxiway. The airplane sustained substantial damage to the right wing. The pilot stated that there were no preaccident mechanical anomalies with the airplane that would have precluded normal operation. The pilot's improper recovery from a bounced landing, and his failure to maintain directional control. The pilot was landing a nose wheel-equipped airplane on a dry, paved runway. The pilot stated that after touchdown the airplane bounced and the nose of the airplane veered to the left of the runway centerline. In an attempt to correct the veer, he applied right rudder while adding engine power. When the airplane settled to the ground, and the left main wheel touched down, it pivoted the airplane sharply to the left. The pilot then applied full engine power in an attempt to abort the landing, but the right wing struck the runway, and the airplane subsequently went off the left side of the runway. The airplane continued into an area of grass-covered terrain, and the nose wheel collapsed, before the airplane came to rest on an adjacent taxiway. The airplane sustained substantial damage to the right wing. The pilot stated that there were no preaccident mechanical anomalies with the airplane that would have precluded normal operation. ANCHORAGE – No injuries have been reported after a small plane crashed at Merrill Field, police say. 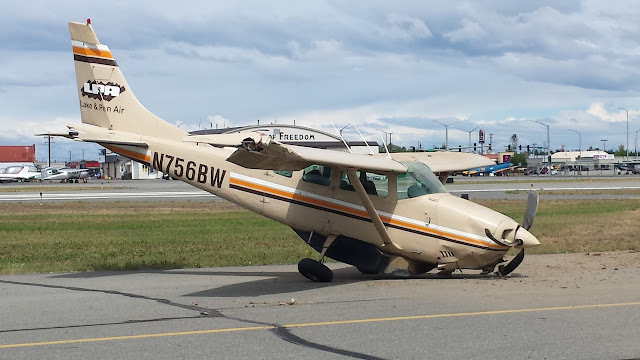 A small commercial plane from Lake and Pen Air was coming in for a landing at the airport on Saturday afternoon when it hit the runway and bounced, according to a release from the Anchorage Police Department. The plane eventually came to a stop. At about 2:20 p.m., APD and the Anchorage Fire Department responded to the crash. Neither the pilot nor the four passengers were injured, police say. Police say the Merrill Field manager is awaiting the arrival of the National Transportation Safety Board to investigate. A small plane skidded off the runway after a hard landing at Anchorage's Merrill Field airport Saturday afternoon, according to the Anchorage Police Department. The incident led to the closure of one of the airport's three runways, but none of the five people onboard was hurt. At 2:19 p.m., the Lake Pen Air plane "hit the runway hard" while landing and bounced, according to the APD release. The pilot then attempted to abort the landing and take off again, but the engine stalled and the plane skidded. It hit a median and lost its landing gear before coming to a stop, the release said. An Anchorage Fire Department dispatcher around 3 p.m. said that the fire department was no longer at the scene and added that all occupants had been removed from the plane safely. No one answered the phone at the airport manager's office Saturday afternoon. And a man who answered the phone in the airport's control tower wouldn't answer questions, saying a reporter was forbidden from calling the tower. An employee who answered the phone at Spernak Airways at the airport said that one of Merrill Field's three runways had been shut down. But he added that it didn't appear to be a big deal -- just "an expensive deal," he added. The pilot was performing a series of aerobatic flight maneuvers at a low altitude during an airshow. Another airshow pilot, who was familiar with the accident pilot’s airshow routine, reported that the accident pilot intended to do a 45-degree knife-edge climb, perform a “Lomcevak” maneuver, and then continue the knife-edge climb. Video recordings taken by persons on the ground showed the airplane in a knife-edge climb. The pilot then entered the Lomcevak maneuver by performing a climbing snap-roll to the left. The airplane pitched nose-down and tumbled two times to the left while descending. Rather than returning to the knife-edge climb, the airplane instead entered a left spin and completed about two and a half revolutions before it impacted the terrain. The video recordings indicated that the engine was operating throughout the flight to ground impact. A postaccident examination of the airframe and engine revealed no evidence of mechanical malfunctions or failures that would have precluded normal operation. A review of medical, pathological, and toxicological information revealed no evidence of any medical condition or substance that would have contributed to the pilot’s loss of control during performance of aerobatic maneuvers. The pilot’s failure to maintain airplane control during a low-level aerobatic flight maneuver. On June 27, 2015, about 1353 central daylight time, a Christen Industries Pitts S-2B, N877UP, sustained substantial damage when it impacted terrain during an aerobatic flight at the Cameron Memorial Airport (EZZ), Cameron, Missouri. The airline transport pilot received fatal injuries. The airplane was registered to and operated by the pilot under the provisions of the 14 Code of Federal Regulations as a Part 91 airshow flight. Day visual meteorological conditions prevailed for the airshow demonstration flight that departed from EZZ about 1340. No flight plan was filed. The pilot's flight demonstration card used during the airshow indicated that he planned to do 10 aerobatic maneuvers during the flight. For the ninth maneuver, it indicated that he planned to do a Lomcevak maneuver, an advanced aerobatic maneuver. An airshow pilot who was familiar with the accident pilot's airshow routine, reported that the accident pilot intended to do a 45-degree knife-edge climb, perform the Lomcevak maneuver, and then continue the knife-edge climb. Video recordings taken by persons on the ground showed the airplane flying the planned routines. The eighth aerobatic maneuver was a steep climb maneuver to a near stalled condition that the pilot titled a "chopper (helicopter) pass." After the chopper pass, the airplane entered a dive to gain airspeed. It then flew straight and level for about 5 seconds before doing a course reversal by pulling up into a left climb and then turning back to the right before diving down to gain airspeed. Then it pulled up and flew straight and level for about 4 seconds before entering into about a 30-degree knife-edge climb. During the knife-edge climb, the airplane appeared to enter the Lomcevak maneuver by doing a climbing snap-roll to the left. The nose of the airplane pitched down and the airplane tumbled two times to the left while descending. The airplane entered a left spin and completed about two and a half revolutions before it impacted the terrain. The 50-year-old pilot held an airline transport pilot certificate with single-engine land, multi-engine land, helicopter, airplane instrument, and helicopter instrument ratings. 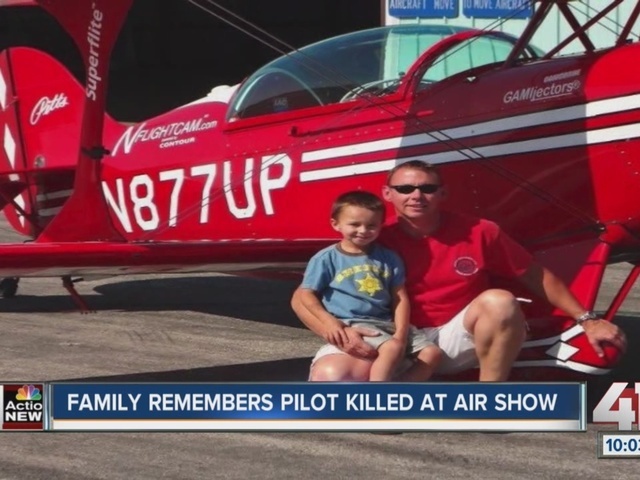 He was also an instructor pilot with airplane single-engine, multi-engine, helicopter, airplane instrument, and helicopter instrument instructor ratings. He held a first class medical certificate issued in February 15, 2015. The pilot completed an insurance application on August 25, 2014, that indicated that he had a total of 11,000 flight hours with 200 hours in the accident airplane make and model. The pilot held a Level 3 Statement of Aerobatic Competency from the Federal Aviation Administration for solo aerobatics with a 500 ft base altitude limit in Pitts airplanes. The Level 3 flight evaluation was conducted on May 7, 2015. The airplane was a Christen Industries factory-built, tandem two-seat, experimental single-engine Pitts S-2B biplane manufactured in 1985. It was equipped with a 300-horsepower aerobatic Lycoming AEIO-540-D4A5 engine, serial number L-22892-48A. The engine powered a 3-bladed MT propeller. The most recent annual maintenance inspection was conducted on May 1, 2015, with a total aircraft time on 1,806 hours. The airplane had 1,819 total hours at the time of the accident. The engine had a total time of 141.2 hours since the last overhaul. At 1353, the surface weather observation at Kansas City International Airport (MCI), located 33 nm northwest of EZZ, was: wind variable at 5 kts; visibility 10 miles; sky condition scattered clouds at 4,500 ft; temperature 26 degrees C; dew point 16 degrees C; altimeter 30.10 inches of mercury. The airplane impacted the trees and terrain in a shallow nose down attitude with a high vertical descent rate. The engine compartment, fuselage, wings, and empennage exhibited crushing and buckling from the ground impact, but the airplane remained intact. There was no post impact ground fire. The engine compartment exhibited upward crushing, and the leading edges of the wings did not exhibit aft crushing. Flight control continuity was confirmed from all flight control surfaces to their respective cockpit controls. The elevator trim continuity was confirmed from the elevator trim tabs to the elevator trim control. The engine was shipped to the manufacturer for examination. The examination revealed that the damage to the engine would not preclude an engine run on a test stand. Due to impact damage, the following slaved parts were used during the engine run test: fuel servo, magneto harness, 2 spark plugs, 3 intake pipes, oil supply hoses, fuel supply hoses, oil filter base, fuel pump, and starter support. The engine was installed in an engine test cell for an engine run. The engine was started and operated at the following points: 1) warm up at 1,500 rpm for 5 minutes; 2) run at 1,800 rpm for 5 minutes; 3) run at 2,200 rpm for 5 minutes; 4) magneto check at 2,200 rpm; 5) rated run at 2,700 rpm for 10 minutes; 6) idle run for 5 minutes; and 7) manual acceleration check. The engine passed all points within the prescribed limits of the engine run. The fuel pump was examined. It displayed significant damage, including several cracks in the body, and separation at the screw-fastened interface between two of the subcomponents, and with two of the screws no longer in their installed position, and others loose. The screws and their mating, threaded holes were examined. None of the screws were broken, but all of them had metallic material present in their lower threads, along with some hardened, blue colored nonmetallic substance consistent with a cured thread locking compound. The mating, internal threads in the pump body were severely stripped. The autopsy of the pilot was performed at the Frontier Forensics Morgue, Kansas City, Missouri, on June 28, 2015. The cause of death was from multiple blunt force injuries sustained in an airplane accident. A Forensic Toxicology Fatal Accident Report was prepared by the FAA Civil Aerospace Medical Institute. No carbon monoxide was detected in the blood (cavity). No ethanol was detected in the vitreous. Azacyclonol was detected in the urine but not detected in the blood (femoral). Fexofenadine was detected in the urine and the blood (femoral). Ibuprofen was detected in the urine. Fexofenadine is a non-sedating antihistamine available over the counter; it is commonly marketed with the name Allegra. Ibuprofen is a non-steroidal anti-inflammatory medication available over the counter with the names Motrin and Advil. The National Transportation Safety Board's (NTSB) Vehicle Recorder Division received three image files containing video and audio that captured the accident. The recorder laboratory correlated the videos to local time and a summary of the flight was made. In brief, the video files showed the aircraft performing aerobatic maneuvers while producing a smoke oil trail throughout the flight. At 1351:56, the aircraft was straight and leveled as it prepared for its next maneuver two seconds later. At 1351:58, the aircraft began to climb. The smoke oil trail indicated a constant angle climb. Two seconds later the aircraft rolled left wing down as it continued its constant angle climb. At 1352:02, the aircraft performed a 360 degree rolling maneuver which resulted in the aircraft tumbling toward the ground. The tumble was similar to an aerobatic maneuver known as the "Lomcevak". At this time, the sound of the engine became faint and the trailing smoke oil began to dissipate. At 1352:11, the aircraft continued tumbling and smoke oil trails became visible again when the sound of the engine became noticeable again. The sound of the engine and smoke oil trails remained noticeable until impact. At 1352:12, the aircraft ended its tumble but continued nose down descending toward the ground. At 1352:13, the sound of the engine ends as the aircraft impacted the ground. The Lomcevak is a family of aerobatic flight maneuvers where the aircraft, with almost no forward airspeed, rotates on chosen axes due to gyroscopic precession and torque of the rotating propeller. One type of Lomcevak is an when the pilot follows a knife-edge roll by flipping the airplane end-over-end and into a spin, from which the pilot then recovers control of the airplane. On June 27, 2015, about 1353 central daylight time, a Christen Industries Pitts S-2B, N877UP, sustained substantial damage when it impacted terrain during an aerobatic flight over the Cameron Memorial Airport (EZZ), Cameron, Missouri. The airline transport pilot received fatal injuries. The airplane was registered to and operated by the pilot under the provisions of the 14 Code of Federal Regulations as a Part 91 airshow flight. Day visual meteorological conditions prevailed for the airshow demonstration flight that departed from EZZ about 1330. No flight plan was filed. The pilot's flight demonstration card used during the airshow indicated that the pilot planned to do 10 aerobatic maneuvers during the flight. For the ninth maneuver, it indicated that he planned to do a Lomcevak maneuver. An airshow pilot who was familiar with the accident pilot's airshow routine, reported that the accident pilot intended to do a 45-degree knife-edge climb, perform the Lomcevak maneuver, and then continue the knife-edge climb. Video recordings taken by persons on the ground showed the airplane flying through the planned routines. Between the eighth and ninth aerobatic maneuvers, the videos showed the airplane doing a course reversal, and then flying straight and level before entering into a knife-edge climb. During the knife-edge climb, the airplane appeared to enter the Lomcevak maneuver by doing a climbing snap-roll to the left. Then the nose of the airplane pitched down and the airplane tumbled two times to the left while descending. The airplane appeared to enter a left spin and completed about two and a half revolutions before it impacted the terrain. The airplane impacted the trees and terrain in a shallow nose down attitude with a high vertical descent rate. The engine compartment, fuselage, wings, and empennage remained intact and there was no post impact ground fire. The engine compartment exhibited upward crushing, and the leading edges of the wings did not exhibit aft crushing. Flight control continuity was confirmed from all flight control surfaces to their respective cockpit controls. The elevator trim continuity was confirmed from the elevator trim tabs to the elevator trim control. The engine will be shipped to the manufacturer for an engine teardown examination. The videos and still photographs of the accident flight will be examined at the National Transportation Safety Board's (NTSB) Vehicle Recorder laboratory. 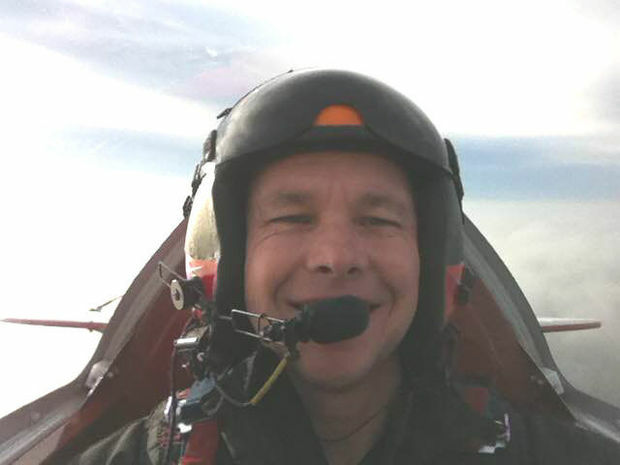 SMITHVILLE, MO | Steven Carl O'Berg, 50, died Saturday, June 27, 2015, while piloting his beloved Pitts S2-B aerobatic plane at the Cameron Air Show. Steve was born May 29, 1965, to Fremont "Dusty" and Marlene (Silver) O'Berg in Oklahoma City, OK. He graduated from Gardner-Edgerton (KS) High School in 1983. On Feb. 4, 2010, he married Karri Williams of Topeka, KS. He retired from a 23-year military career in 2007. Since his military retirement, he flew in a variety of private aviation roles. Steve flew both rotor and fixed wing aircraft over his career span. He accumulated over 5,000 military flight hours including over 400 combat hours in Iraq. His private flight hours totaled over 7,000 hours. Steve approached everything in life full bore and with passion. This included his love for his family, anything aviation and his hobbies. If it included an adrenaline rush it was likely a hobby of Steve's. Motorcycles, snowmobiles, boats, skiing, wakeboarding, skydiving, anything fast! The only things he did slow were eat and arrive at family functions. His quick wit, sense of humor and ability to see the sunny side of everything will be so missed by his family and friends. He spent his life doing for others. He was preceded in death by his grandparents, Fremont "Red" Sr. and Edna O'Berg and Horace and DeLamar Silver; and his father, Fremont "Dusty" O'Berg. 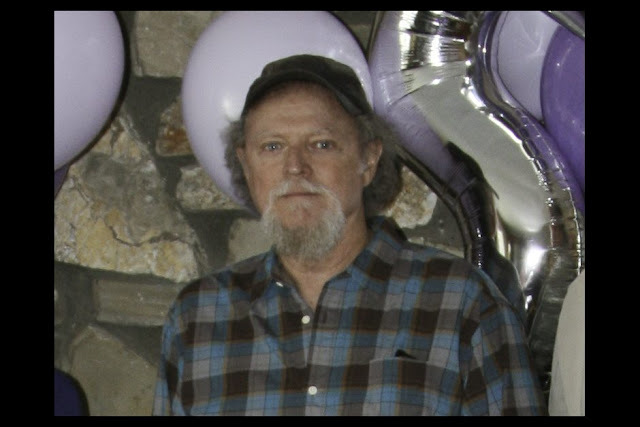 He is survived by his wife, Karri (Williams) and two children, Stephanie Rainbolt (Rusty) and Brody O'Berg; two stepdaughters, Danielle Sumpter (Brent) and Whitney Peavler; two grandchildren, Evie and Wyatt Rainbolt; his mother, Marlene O'Berg, sister, Vickie Couch (Michael); sister, Marilyn Davidson (David); brother, David O'Berg; sister, Julie Harper (Donny); as well as numerous nieces, nephews and cousins and countless extended friends and family spread across the globe. Visitation is from 5 p.m. to 7 p.m. CDT Tuesday, July 7, at Bruce Funeral Home 106 S Center, Gardner, KS. Memorial services will be at 10 Wednesday, July 8, at Paradise Pointe Golf Complex, 18212 Golf Course Road, Smithville. In lieu of flowers, the family suggests memorial donations to the Aircraft Owners & Pilots Association (AOPA.org) or the Experimental Aircraft Association (EAA.org) KS. Bruce Funeral Home is in charge of arrangements. Three people walked away from a Saturday morning airplane crash at Natrona County International Airport, according to local authorities. The trio, who were not identified, sustained injuries of unknown severity and were transported to Wyoming Medical Center for evaluation. 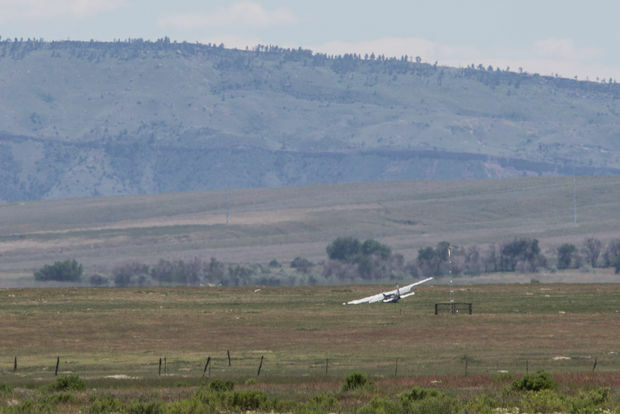 The crash occurred shortly after the single engine Cessna took off from the airport around 8 a.m., said Lt. Stewart Anderson, Natrona County Emergency coordinator. The passengers reported the plane reached an elevation of about 100 feet when it lost power and plummeted to the ground. The plane hit the earth about 1,500 feet west of the airport runway, authorities said. It did not catch fire, but was heavily damaged, they said. Natrona County Fire Protection District, Mills Fire Department, Natrona County Airport Public Safety and Wyoming Medical Center responded to the scene, Anderson said. No property was injured in the crash. He said he could not comment on the severity of the trio's injuries, but noted each person walked away from the plane. Flights were running on time Saturday afternoon, said Mike Hendershot, the airport's public safety chief. The crash did not cause any flight delays, he said. Officials were waiting on representatives of the National Transportation Safety Board and Federal Aviation Administration to arrive Saturday afternoon. Both agencies will investigate the cause of the crash. Incidents like Saturday morning's crash are fairly uncommon, Hendershot said. "We’ll have an aircraft blow a tire and go off the side of the runway, but not like this," he said. A floatplane pilot for a Ketchikan-based air tour operator and the company's safety "culture" were directly responsible for the 2015 crash that killed the pilot and eight cruise-ship passengers on a shore excursion, the National Transportation Safety Board found Tuesday. Meeting in Washington, D.C., the board's four current members unanimously found that the cause of the crash was Promech Air pilot Bryan Krill's "decision to continue visual flight into an area of instrument meteorological conditions that resulted in geographic disorientation and controlled flight into terrain." The de Havilland Otter slammed into a mountainside near Ella Lake, roughly 20 miles northeast of Ketchikan, on its return from Misty Fjords National Monument on June 25, 2015. It was carrying a group of passengers from the Holland America Line's MS Westerdam. The board also blamed the crash on a Promech company "culture" that "tacitly endorsed flying in hazardous weather and failed to manage the risk associated with the competitive pressures affecting Ketchikan-area air tour operators." The company's lack of a formal safety program and its inadequate operational control of releasing flights for departure were also cited. After about two hours of discussion during Tuesday's meeting, NTSB staff proposed citing Promech's approach to safety – in which some pilots reported being pressured to fly despite poor weather – as a contributing factor to the crash. Robert Sumwalt, the board's acting chair, asked that those issues be upgraded to a causal factor of the crash, which the board unanimously approved. "Promech and at least one other operator that was willing to take more weather-related risks were both able to fly more revenue passengers than two other more conservative operators who cancelled flights that day," the NTSB said in a statement on the findings Tuesday. Promech's Alaska operations were purchased in 2016 by Taquan Air, a competing carrier in Ketchikan. Taquan officials said they were still considering the board's findings Tuesday and didn't have immediate comment. Board members also discussed competitive and time pressures among air tour operators in Ketchikan, including the fact that Promech's flights were running too late on the day of the crash to return by the 12:30 p.m. "all-aboard" time for Westerdam passengers to leave Ketchikan. Missing the deadline meant Promech would have to transport the passengers to their ship's next port of call at its own expense. "Lives depended on the pilot's decision making," Sumwalt said in the NTSB statement. "Pilot decisions are informed, for better or worse, by their company's culture. This company allowed competitive pressure to overwhelm the common-sense needs of passenger safety in its operations. That's the climate in which the accident pilot worked." New details were revealed Tuesday about the events leading up to a 2015 plane crash near Ketchikan that killed nine people, eight of them cruise-ship tourists, when their flightseeing plane slammed into a mountainside. The details included the opinions of colleagues that the pilot was responsible and skilled. 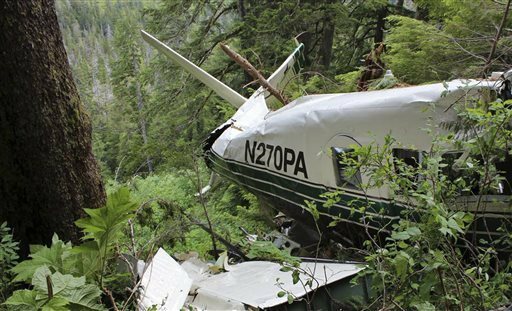 The National Transportation Safety Board released a factual docket Tuesday with dozens of investigative documents tied to the de Havilland Otter crash on June 25, 2015, in Misty Fjords National Monument. Everyone on board the Promech Air flight was killed: pilot Bryan Krill, 64, and eight passengers from the Holland America Line's MS Westerdam on a shore excursion. A preliminary NTSB report released shortly after the crash indicated the plane was returning from a flightseeing trip, flying in "marginal" weather conditions under visual flight rules when it crashed into a rock face near Ella Lake, about 20 miles northeast of Ketchikan around 12:15 p.m.
Clint Johnson, NTSB's Alaska chief, said Tuesday the difficulty of even reaching the wrecked plane, located on a steep mountainside, was a hindrance to examining the site. "This was one of the most challenging sites we've been to in five years," Johnson said. Johnson characterized the crash as a CFIT, or "controlled flight into terrain." Promech's Alaska operations were bought out by Ketchikan-based Taquan Air in 2016. A message left Tuesday with Taquan wasn't returned. The docket contains reports analyzing everything from the aircraft's flight data to images captured on tourists' smartphones and interviews with cruise line and Promech employees. According to the NTSB records, several Promech pilots and staff considered Krill — a pilot with 1,200 hours of Alaska flight time — a mentor figure with exemplary piloting skills, someone who would often decide not to fly due to weather conditions. The company's president and CEO at the time, Marcus Sessoms, told NTSB Krill once visited his office to apologize for aborting a tour and landing in Ketchikan due to rain other pilots were flying through. "(Krill) said 'Boss, I'm sorry. It was raining and I didn't feel comfortable,'" investigators wrote. "Mr. Sessoms told him, 'You never have to say sorry to me for coming back. When you come back I will pat you on the back every time.'" But some other pilots at Promech had a different view of Krill's piloting habits. One of them told investigators in one incident near Ella Lake, Krill had ignored warnings of downdrafts and his plane's floats struck trees when he flew through the area. NTSB later learned Krill had flown two tour flights on the day of the incident. "An entry in the pilot's logbook from that day, June 14, 2015, read, 'Misty Trip, Thought I was dead,'" investigators wrote. "Investigators contacted some of the passengers who had been on those flights. They did not recall anything out of the ordinary about the flights except that they had been turbulent." Just 11 days later, the day of the crash, NTSB investigators said Krill safely flew two tour groups from Ketchikan harbor to Rudyerd Bay in Misty Fjords and back. A cruise ship shore excursion manager told investigators Taquan Air, which also offered flightseeing packages for cruise passengers, had cancelled all of its tours early that morning due to weather. On his third trip of the day, Krill was the third of four Promech planes making the flight. The planes took a southern "long route" to Rudyerd Bay, about five minutes slower but considered safer in poor weather by pilots because more of it was over water, than the largely overland "short route" through Ella Narrows and over Ella Lake. After a pilot from another company radioed that weather over Ella Lake was "wide open," three of the four Promech pilots, including Krill, opted to return by the "short route." Two of those planes flew safely through the area. Krill's Otter never made it back. Sessoms told NTSB Krill was expected back in Ketchikan at 12:40 p.m., because the cruise passengers needed to return for the ship's departure. When Krill didn't answer his radio, Sessoms took off in another Otter to look for the plane; he was in the air when Promech staff reported hearing a signal for Krill's emergency locator transmitter. Responders located the crash site at about 3 p.m., and confirmed there were no survivors. The crashed Otter carried a terrain avoidance warning system, intended to provide visual and audio alerts of oncoming hills or mountains. Promech pilots told the NTSB the system could be manually disengaged by means of an "inhibit" switch, which was often done in some areas — including near Rudyerd Bay — where it would sound too frequently. The system in Krill's plane was found disengaged at the crash site. Additionally, an NTSB examination of Promech's safety training found the company's general operating manual called for flights to be approved "in joint agreement and coordination between the pilot and flight scheduler." The Promech flight scheduler who handled Krill's flight that day later said the company had no formal training program for her position. Her own training "consisted of studying the company general operations manual and operations specifications, and on-the-job training." "Asked whether she could recall having any conversations with (Krill) about the weather that morning, she said she only recalled the weather report when he was outbound on the first round of flights," investigators wrote. "That was all she could remember coming from him." The NTSB noted Promech had been working with the Medallion Foundation, a nonprofit accident-avoidance group formed by the Alaska Air Carriers Association. The organization allows carriers to earn "stars" for elements of its operations, including work to avoid controlled-flight-into-terrain crashes and overall safety. Promech officials told the NTSB that the company had earned a star for CFIT avoidance. Investigators noted Promech's CFIT avoidance procedures, developed jointly with the foundation, were not a part of the company's general operating manual or its training program, both of which had been approved by the FAA. Investigators also tried to request details on Medallion's audits of Promech. "Multiple requests by the NTSB to both Promech and Medallion Foundation for additional information regarding Promech's external and internal Medallion audits were denied," investigators wrote. Staff at the Medallion Foundation said the organization's executive director, Jerry Rock, was traveling and unavailable for comment Tuesday. "There should be no conclusions that should be drawn from this information — this is a data dump," Johnson said. A final report on the crash's probable cause will probably be released the last week of April. Keith Holloway, an NTSB spokesman, said the determination of cause may occur during a formal meeting of the five-member board, which is currently short by one member pending an appointment by President Donald Trump, during a hearing in Washington, D.C. The date for that meeting has not been set. This is preliminary information, subject to change, and may contain errors. Any errors in this report will be corrected when the final report has been completed. NTSB investigators traveled in support of this investigation and used data obtained from various sources to prepare this aircraft accident report. On June 25, 2015, about 1215 Alaska daylight time, a single-engine, turbine-powered, float-equipped de Havilland DHC-3 (Otter) airplane, N270PA, sustained substantial damage when it impacted mountainous tree-covered terrain, about 24 miles northeast of Ketchikan, Alaska. The airplane was being operated under the provisions of 14 Code of Federal Regulations (CFR) Part 135, as an on-demand visual flight rules (VFR) sightseeing flight when the accident occurred. The airplane was owned by Pantechnicon Aviation, of Minden, Nevada, and operated by Promech Air, Inc., of Ketchikan. The commercial pilot and eight passengers were fatally injured. Marginal visual meteorological conditions were reported in the area at the time of the accident. The flight departed a floating dock located in Rudyerd Bay about 44 miles northeast of Ketchikan about 1200 for a tour through Misty Fjords National Monument Wilderness. A company VFR flight plan was in effect. At the time of the accident, the flight was returning to the operator's base at the Ketchikan Harbor Seaplane Base, Ketchikan. The flight was a sightseeing flight for passengers of a cruise ship that was docked in Ketchikan. The tour, named Cruise/Fly, consisted of two groups of passengers. One group departed Ketchikan onboard a marine vessel and the other group departed via airplane, with a predetermined rendezvous at the floating dock in Rudyerd Bay. Once at the floating dock, the two groups would switch transportation modes for the return trip to Ketchikan. The operator reported that the accident airplane departed Rudyerd Bay as the third of four float-equipped airplanes on air tour flights over the Misty Fjords National Monument Wilderness. The airplanes departed about 5 minutes apart, and the standard route of flight was southwest, over an area of remote inland fjords, coastal waterways, and mountainous tree-covered terrain. When the airplane failed to return to Ketchikan, the operator initiated a search for the missing airplane and heard an emergency locator transmitter (ELT) signal along the accident pilot's anticipated route of flight. A helicopter from Temsco Helicopters, Inc., of Ketchikan, was dispatched to the suspected accident site to search for the missing airplane. However, the helicopter pilot said that he was unable to search the upper levels of the mountainous areas due to low ceilings and poor visibility. The helicopter pilot said that, after waiting for the weather conditions to improve, he was able to search the upper elevations of the search area and located the wreckage about 1429. The Ketchikan Volunteer Rescue Squad (KVRS) team members reached the accident site and confirmed that the airplane's occupants had sustained fatal injuries. The NTSB investigator-in-charge along with another NTSB investigator, with help from KVRS, reached the accident site on the morning of June 27. 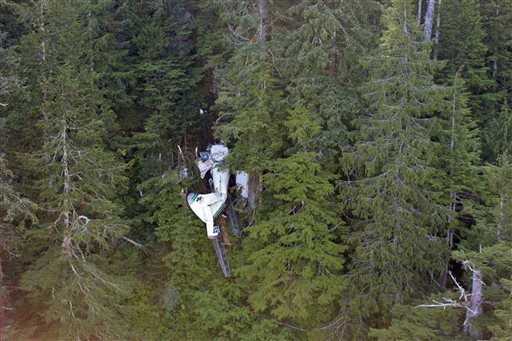 The airplane impacted trees and a near vertical rock face in a nose high, wings level attitude at an elevation of about 1,600 feet mean sea level and came to rest upright on top of its separated floats, in an area of heavily forested, steep terrain. The accident airplane was equipped with a Pratt & Whitney PT6A-135A engine that produces 750 shaft horsepower. A comprehensive NTSB postaccident examination of the engine and airframe is pending, after the airplane wreckage is recovered to Ketchikan. The closest weather reporting facility is Ketchikan Airport (KTN), Ketchikan, AK, about 24 miles southwest of the accident site. At 1153, an aviation routine weather report (METAR) at KTN reported in part: wind 130 degrees at 15 knots, gust 23 knots; visibility 6 statute miles, rain and mist, runway 11 visual range 4,000 variable to greater than 6,000 feet; few clouds 800 feet, broken clouds 1,200 feet, overcast clouds 2,700 feet; 61 degrees F; dew point 57 degrees F; altimeter 29.91 in Hg. The National Transportation Safety Board says it’s not their problem. The Alaska State Troopers says it’s out of their hands. And while the Ketchikan Volunteer Rescue Squad secured the plane to the mountainside, they’re saying it’s no longer up to them. The DeHavilland DHC-3 that crashed near Misty Fjords National Monument, killing nine, still clings to the side of a rather rocky p lace. Chris John is with the Ketchikan Volunteer Rescue Squad. He says the squad’s job was to try and rescue anyone who may have survived and make sure the area was safe for NTSB investigators. The investigation is ongoing, but the NTSB says it has nothing to do with plane removal. So how is this remedied? Just left large piece of twisted metal stuck on a mountainside? As it turns out, Temsco Helicopters, which originally found the crash site and helped with the rescue mission, has volunteered to help fly the wreck out. Except there’s one problem: the only helicopter big enough to retrieve the aircraft is up north, fighting fires. This leaves some of the volunteer rescue squad’s ropes and straps, securing the plane, up on the mountain with the mound of metal. Eric Lunde, another Ketchikan Rescue Squad volunteer, says the weathered equipment will have to be replaced. Lunde says either the Troopers will help refund the lost items, they will have to ask for grants or, most likely, KVRS will have to ask for donations to make sure they’re ready for future missions. While Temsco officials say they still plan on extracting the plane, they won’t guarantee anything until the large helicopter returns from the blazes up North. Bryan Krill, the pilot of the sightseeing floatplane that crashed Thursday in Misty Fjords National Monument, is seen here in a February 2015 photo. ANCHORAGE, ALASKA — A sightseeing floatplane that crashed in a mountainous area in southeast Alaska, killing all nine people on board, was equipped with technology to provide detailed information about the terrain, according to a federal accident report released Tuesday. The deHavilland DHC-3 Otter turboprop crashed on a steep cliff about 25 miles from Ketchikan, killing the pilot and eight cruise ship passengers. The excursion was sold through the cruise company Holland America and operated by Ketchikan-based Promech Air. NTSB has recovered two instrument displays in the wreckage that are part of a terrain-avoidance technology known as the Capstone program, according to Clint Johnson, head of the NTSB Alaska office. The damaged displays were sent to a Washington, D.C., lab, where information will be downloaded. Pilot Bryan Krill, 64, of Hope, Idaho, was flying under visual flight rules, a set of regulations used when the weather is more or less clear enough for a pilot to see where the aircraft is going. The rest of the plane remains at the crash site, 800 feet above Ella Lake. The extreme steepness of the location has slowed recovery of the wreckage, Johnson said. Promech declined to discuss the NTSB report, saying the agency "specifically asked Promech not to comment on any of their briefings or reports," according to Thompson & Co. Public Relations, which is representing Promech. The Capstone program generally provides GPS technology that allows pilots to see on cockpit displays concise information about terrain, other aircraft in the area and weather. The equipment is not designed as a blind guide in such conditions as flying through clouds but is used as backup to what the human eye can see. "The most important thing here is, it gives the flight crew the ability of situational awareness — where the airplane is in relative proximity to rising terrain or whatever," Johnson said. "It's not a save-all. It's a tool that's used in terrain avoidance." Johnson said he doesn't know how complete the technology was on the plane that crashed. The crash occurred as the plane was on its way back from Misty Fjords National Monument, a wilderness area of glacial valleys, lakes and snowcapped peaks. Johnson said other pilots were reporting marginal visual flight conditions in the crash area. A meteorologist working on the case will be looking at the weather at the time of the crash. But Johnson said it's far too early to say if weather was a factor. "At this point right now, the jury's still out on that," Johnson said. Krill’s youngest brother, Bryan Krill, 64, was flying a float-equipped de Havilland DHC-3 Otter on Thursday when it crashed into a rock face in Misty Fjords National Monument. Bryan Krill, who was from Hope, Idaho, and the eight passengers on board were killed. Alaska State Troopers identified Krill and the eight other passengers late Friday: Rowland Cheney, 71, and Mary Doucette, 59, both of Lodi, California; Glenda Cambiaso, 31, and Hugo Cambiaso, 65, both of North Potomac, Maryland; June Kranenburg, 73, and Leonard Kranenburg, 63, both of Medford, Oregon; Margie Apodaca, 63, and Raymond Apodaca, 70, both of Sparks, Nevada. John Krill said his brother was married and had two daughters. He began flying in the 1970s and flew commercially for a company in Idaho and for Promech Air, the Ketchikan-based company that operated Thursday’s flight, John Krill said. “He really loved flying -- he made every effort to learn the skills and do it,” he said. Promech, in a prepared statement Saturday morning, said Bryan Krill started working with the company earlier this year as a summer pilot. He had 4,300 hours of flight experience, including roughly 1,700 hours piloting single engine seaplanes, the statement said. “I’d just emphasize that he’s not a hot dog,” he added. John Krill never flew with his brother, but he said his characterization was based on the experience of a third brother, David, and of Bryan Krill’s two daughters. All had flown with Bryan Krill and said he was careful, John Krill said. He added that Bryan Krill had also been a businessman. At various points, he owned a franchise of Mexican restaurants in Arizona and southern Nevada, as well as an equipment rental company in Southern California, his brother said. Bryan Krill had lived in Idaho for “a long time,” John Krill said. He added that he wasn’t clear about the details of his brother’s flying career in Alaska. John Krill said Bryan Krill was “in good shape” at age 64. “I just saw him in February -- he was looking good then,” John Krill said. The company that owned and operated the airplane that crashed into a cliff in Alaska killing nine people also owns Key West Seaplane Adventures. Promech Air is a charter plane company based in Ketchikan, Alaska that offers sightseeing tours of Southeastern Alaska, while its sister company in Key West offers tours to the Dry Tortugas and Fort Jefferson. Key West Seaplane Adventures general manager Peter Green said he has not had much contact with the Alaskan company since the accident. A flight carrying a pilot and eight passengers crashed into a cliff 800 feet above Ella Lake on Thursday afternoon, killing all nine aboard. Emergency crews were still attempting to recover the bodies as of Friday afternoon and the cause of the crash is still unknown. The names of the deceased will not be released until all families have been notified. While the name of the pilot has not been released, Green confirmed that the pilot was never an employee of the Key West site. The plane, a Havilland DHC-3 Otter, is the same aircraft used by Key West Seaplane Adventures. The company has a fleet of six planes similar to the one that crashed, two in Key West and four in Alaska. Weather conditions in the area of the crash were poor enough that search operations could not be initiated until Friday. Green said there are a variety of environmental factors taken into account before deciding whether or not to take to the sky. Key West Seaplane Adventures will continue operating as usual but changes may be made depending on the outcome of the Alaskan investigation. Last week, the National Transportation Safety Board released a preliminary report on the recent crash of a sightseeing flight in Misty Fjords National Monument near Ketchikan that killed the pilot and eight passengers. But that report is only the beginning of an extensive investigation. It will likely be a year before a probable cause for the accident is determined, and during that period the NTSB will conduct a staggering amount of research into the circumstances surrounding the crash. This is familiar territory for the agency and also, sadly, all too familiar for Alaskans as well. Pilot Brian Krill was flying a single-engine turbine de Havilland Otter aircraft for the air taxi service Promech Air. Once the Otter's wreckage is transported to Ketchikan by the aircraft insurance company, it will be received by the NTSB. “The engine will immediately be placed in a sealed can and then shipped to the manufacturer," Clint Johnson, NTSB Alaska Region director said. The turbine engine from this Otter was made by Pratt and Whitney and will likely be shipped to the company's Montreal facility for a detailed post-accident examination. "While transported it will be escorted and later opened under NTSB supervision,” Johnson said. According to Johnson, the fuselage will remain in Ketchikan where it will be examined by an NTSB structural engineer and representatives of the Viking Air Limited Corporation which now owns the type certificate for the de Havilland DHC-3 Otter airplane. The eight passengers onboard the aircraft were all passengers on the Holland America Westerdam, which sold tickets for the "Cruise/Fly" shore excursion flight to Rudyerd Bay through a previous arrangement with Promech. As part of its investigation, the NTSB will be speaking with Holland America employees to determine the nature of the interaction between the companies and their personnel, including how directly they engaged with Krill on the day of the accident and whether any pressure might have existed within that relationship. An unusual aspect of Alaska aviation is the degree of contact commercial pilots have with their customers, whether those customers are employees of the U.S. Postal Service, representatives of a company engaged in charter contracts, or ticketed passengers. In reports published on Alaskan air safety in 1980 and 1995, the NSTB has documented how pressure from these customers can have a profoundly negative impact on pilot decision-making. “It is important for pilots, whether they fly for a company or themselves, to always practice good decision making. Establish a set of risk assessment procedures and stick with them; know the minimums under which you will operate and not violate those based on circumstance,” says Harry Kieling, Chairman of the Alaskan Aviation Safety Foundation. The circumstances he refers to includes all manner of pressures, from degrading weather to a desire to get home to the demands of people in the seats. 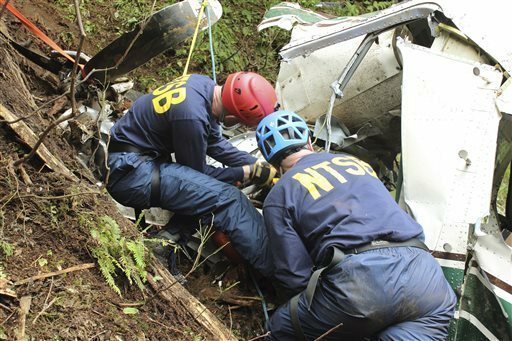 One very effective way to keep outside pressure from influencing pilot decision-making is through cue-based training -- something recommended by the NTSB for Southeast Alaska air tour operators in 2007 following the crash that year of a Taquan Air flight that killed all five people aboard. This training involves establishing checkpoints along regularly flown routes. If, at any time during the course of a flight along on that route, a checkpoint is not visible, then the pilot must turn around. The decision to continue on -- to “go take a look” -- is thus taken out of the pilot’s hands. A 2012 letter from the FAA to the NTSB said that by 2011, all the region's air tour operators had “added materials and concepts developed as part of the cue-based training project to their training programs.” It's unclear, though, if that training expanded beyond videos and ground school discussion to include flight training and published route checkpoints. Whether or not a company uses cue-based training, there's always a need for established contingency plans if a flight cannot depart or continue. “You always need to have the option of spending the night if you can’t fly back because of weather or other safety concerns,” Kieling says. Denali operators, for example, have gear and supply caches on the glaciers for that reason; in 2013, a Talkeetna Air Taxi flight was forced to remain on Ruth Glacier after the weather closed in during a tour. It wasn't immediately clear whether Southeast tour operators maintain similar contingency plans. Investigators will try to determine, for example, whether the boat involved in the excursion the day of Misty Fjords crash was capable of ferrying all of the passengers back to the ship from the floating dock in Rudyerd Bay if the aircraft could not fly, and whose decision it would've been to cancel, if necessary, the flying portion of the trip and revert to a contingency plan. The NTSB won't know, until it completes its long investigation, whether any such pressure may have been exerted on the pilot. And with everything from weather to pilot turnover at Promech to be examined, outside influence is just one element of many to be considered. Krill's flying experience will be thoroughly analyzed, including his number of instrument hours flown and instrument currency. His proficiency at flying solely by instruments would affect his ability to react under inadvertent flight into the marginal weather conditions that were noted by the NTSB. As ADN has noted in the past however, there's a sharp difference between flying under instrument flight rules and attempting to use onboard equipment, such as a GPS, to navigate visually when conditions suddenly diminish. Tour flights, by their nature, are nearly always operated under visual flight rules and in this case, the pilot's ability to suddenly and successfully transfer to instrument flight would have been influenced by factors including his training, ability, specific knowledge of the aircraft and the altitude at which he was flying. The fact that, according to the NTSB, the aircraft impacted "a near vertical rock face in a nose high, wings level attitude" suggests Krill was trying to climb. It's not known whether he could see the terrain around him, but moving map technology would have just served as a guide; it's not intended to replace the situational awareness that is lost when visibility decreases and can never be considered a substitute for instrument flight standards and requirements. Aircraft accidents rarely happen for a single reason. Usually they are the result of a cascade of factors -- factors that can date back months or longer and combine to create the unique set of circumstances resulting in a crash. The skills and knowledge a pilot did or did not learn, the practices a company did or did not encourage, the customer relationships which did or did not influence decision-making and the regulatory compliance the FAA did or did not enforce can contribute to what occurred on a fateful flight. That means aircraft accident investigations are complex and the NTSB will have much to look at as it tries to uncover what went wrong at Misty Fjords. But for Harry Kieling, the air safety advocate, one thing is very clear. On June 25, 2015, a de Havilland Otter operated by Promech Air crashed in Misty Fjords National Monument. The pilot and all eight passengers were killed. 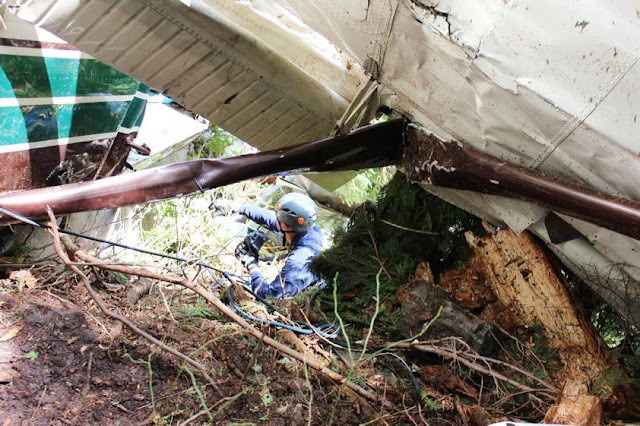 Three weeks later, on July 17, a Wings of Alaska Cessna 207 on a scheduled flight from Juneau to Hoonah crashed into mountainous terrain. The pilot was killed and four passengers seriously injured. The Promech and Wings crashes had something notable in common: Both companies were members of the Medallion Foundation. Medallion was formed as a nonprofit by the Alaska Air Carriers Association in 2001 to "improve pilot safety awareness and reduce air carrier insurance rates." Through the direction of the late Sen. Ted Stevens, the nonprofit organization received an initial federal grant of $3 million dollars in 2002. According to budget requests later filed with the state, Medallion received $17 million in federal funds by 2013. More recently, the organization has also received more than $750,000 from the state. According to publicly filed records, an average of 44 percent of Medallion's annual income pays salaries. This does not include other administrative expenses or the minimum of $60,000 paid annually since 2013 for rental of a building owned by Executive Director Gerard Rock, where the foundation's offices are located. Medallion has developed safety programs in five key areas: CFIT (controlled flight into terrain) avoidance, operational control, maintenance and ground service, safety, and internal evaluation. By completing each "cornerstone," members receive specific Medallion Stars. Those completing all five Stars are then eligible for a Shield after further evaluation. Current Star and Shield members include Air Excursions, Alaska Central Express, Coastal Helicopters, Grant Aviation, Hageland Aviation, Pacific Airways, Ryan Air, Smokey Bay Air, Taquan Air and Wright Air Service, all of which have suffered accidents with fatalities or serious injuries in the past 10 years. On its website, the organization points to escalating accident statistics in the 1990s as an impetus to its formation. According to the National Transportation Safety Board database, in the 10-year period between Jan. 1, 1990, and the last day of 1999 there were 1,733 aircraft accidents in Alaska; 377 of them involved air taxis and small commuters (FAR Part 135 operators). In the 10-year period after Medallion was founded, from Jan. 1, 2001, to the last day of 2010, there were 1,138 total aircraft accidents; 212 involving air taxis and small commuters. However, it must be noted there was a far more dramatic impact on the Alaska aviation industry in this period than Medallion. In 2002, Sen. Stevens spearheaded the passage of the Rural Service Improvement Act. Aimed at stabilizing the passenger, freight and mail system for rural Alaska, RSIA restructured how mail contracts were awarded and resulted in more than two dozen scheduled air carriers going out of business or being purchased by competitors. The impact of the act on Alaska's aviation landscape cannot be overstated, nor can technological innovations such as Capstone and expansion of the FAA's weather-reporting system be ignored. Medallion does not exist in a vacuum and it would be inaccurate to suggest it is solely, or even primarily, responsible for an overall reduction in accidents. Most third-party safety organizations like Medallion developed in recent years as air carriers sought to combat rising insurance rates. Generally, they issue public awards, like Stars and Shields, for completion of administered materials. Recently, the NTSB criticized one such organization, Argus International, after a multiple fatality accident in Ohio. Board Member Robert Sumwalt stated Argus, which had been awarded a "Gold" rating to the charter company involved in the crash, provided only an "illusion of safety" to the aircraft's passengers. A similar perceived sense of security was evident in Alaska in 2013 when Gov. Sean Parnell spoke to the Chamber of Commerce. "Medallion certification diminishes the number of lost lives and injuries due to aviation accidents," Parnell said. "So if you are traveling on a Medallion-certified air carrier, you are traveling with people who have been trained above and beyond the minimum." Ten people were killed in crashes involving Medallion members that year. As Rock told investigators:"… A couple of these industries now require anybody flying for them, that they participate in Medallion for flying in Alaska. And I would say the main reason for that, when you look at the oil industry and the mining industry, most of these companies are from Outside and don't have a lot of Alaska safety experience, don't have winter operation experience. And Medallion gives them a tool to make sure the carriers flying for them here in Alaska actually kind of meet the requirements of flying, you know, in this type of environment." There were problems with Medallion at the Department of Public Safety, however. According to the recently retired aviation section supervisor, the pilots were not involved in the new safety program. "I don't feel like people really participated in it," she told investigators. "… I couldn't seem to get the trooper pilots to be into it." The director of the Alaska Wildlife Troopers (who oversaw the aviation section), told investigators: "… Thinking back over these safety meetings, a lot of it was not even aviation related. It was, you know, like ice falling off a roof or, you know, maybe how fuel may have been stored. I don't recall ever seeing one flight-type safety issue." In its investigation of the Helo-1 crash, the NTSB found in addition to errors by the pilot, there was "… inadequate safety management, which prevented the organization from identifying and correcting latent deficiencies in risk management and pilot training." Medallion's influence was also studied in the investigations into the Promech and Wings of Alaska accidents, where there was some public confusion over their Medallion status. In a 2016 interview with Alaska Dispatch News, Rock stated both companies "failed audits required to maintain membership and were on a yearlong suspension to correct deficiencies." However, the NTSB report on the Wings crash includes a series of email exchanges between Medallion and Wings' owner, SeaPort Airlines, two months before the Hoonah accident. Those exchanges resulted in a voluntary suspension of the Shield but retention of the five Stars. The company's Medallion membership remained intact. In the Promech investigation, its company president stated they held the CFIT Star and were in the process of obtaining the Safety Star. As that report notes, there was no evidence of Promech's Medallion membership status being suspended. Rather, the foundation refused to respond to multiple NTSB requests "regarding Promech's external and internal Medallion audits…"
Those investigations made clear that both companies struggled with decision-making, as well as suffering operational control and apparent FAA oversight failures. Further, the circumstances surrounding the Promech crash in particular, which involved a line of air tour carriers following a pre-established route in marginal weather conditions, are familiar. They echo previous "follow-the-leader" accidents including the 1994 crash of Wings of Alaska enroute to Juneau (seven dead, four seriously injured), the 1995 crash of Island Air Services in Kodiak (four dead), and the 2007 crash of Taquan Air in Misty Fjords (five dead). "And, you know, the pilot decision processes sometimes probably — I hate to say it, but 90 percent of the time, really why these accidents happen, I don't think it's so much the operator. The operator themself (sic) management, provides the tools, the training, but sometimes pilots just make mistakes and unfortunately that's just kind of what leads (to) this." The NTSB recently determined the causes for both the Promech Air and Wings of Alaska crashes were the pilot's decisions to fly under visual flight rules into instrument meteorological conditions. There were contributing factors as well, including, in the case of the Wings crash, the FAA's failure to properly monitor the company, and the company's failure to follow its own operational control procedures. For Promech Air, the board also cited a corporate culture that "tacitly endorsed flying in hazardous weather and failed to manage the risks associated with the competitive pressures affecting Ketchikan-area air tour operators." There are many questions to be raised about the effectiveness of the Medallion Foundation's programs on the recurrent problems plaguing Alaska aviation, and it is doubtful its standardized programs are addressing the issue of individual decision-making with actual pilots themselves. Medallion supporters need to think about the failures among the foundation's membership and what that says about the organization's methods. At some point, it must be asked if the programs are working to increase flight safety, or serve more to impress unwitting passengers, federal investigators and insurers. The brutal truth is what happened to Promech Air and Wings of Alaska in 2015 was just more of what has been happening in the state for decades. It was happening before the funding of millions of dollars and the awarding of Stars and Shields, and it shows no signs of stopping. In May 2016, the FAA issued a letter to the more than 200 regional operators in Alaska. In the wake of five serious crashes dating back to Promech, the agency noted such accidents generally occur due to "inappropriate or nonexistent safety cultures…"
The agency encouraged companies to seek the assistance of the Medallion Foundation. What the FAA failed to note was three of those accidents, like so many before them, involved Medallion members. Colleen Mondor is the author of "The Map of My Dead Pilots: The Dangerous Game of Flying in Alaska."